From what I can gather, the Manly Ferry has, in one form or another, been going since 1855 or for 156 years. This correspondent’s been availing himself of its delights for about 10 years and Back of the Ferry has been going since November 2009. The last couple of days has seen the commencement of a new tradition on the Back of the Ferry, but sadly, the conclusion of another tradition which has been going for 30 years. So to the new tradition first. Christmas is supposed to be about the spirit of giving, but we’ve all endured those embarassing work moments where the social co-ordinator organises the Kris Kringle. Some smart alec buys lingerie for the 55 year old PA, some do-gooder buys a world vision card for the boss or you’ve participated in the Office version of Kris Kringle and seen real meanness as people trade up from a foot spa bath. Well, BotF came up with a fool-proof plan. Each member of BotF buys each-other a six pack. There was going to be some random allocation method worked out, but in the end we all put them in the centre and started drinking from them. 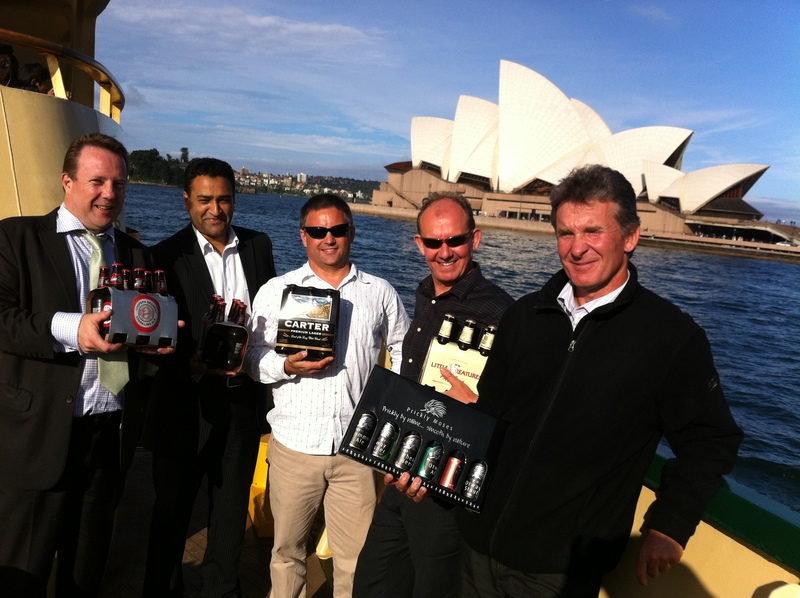 The highlight was the Prickly Moses gift pack and the lowlight was the Carter Premium six-pack – but fun was had by all. We proceeded to the Cantina to demolish what was left and 6 of our 8 correspondents were in attendance. 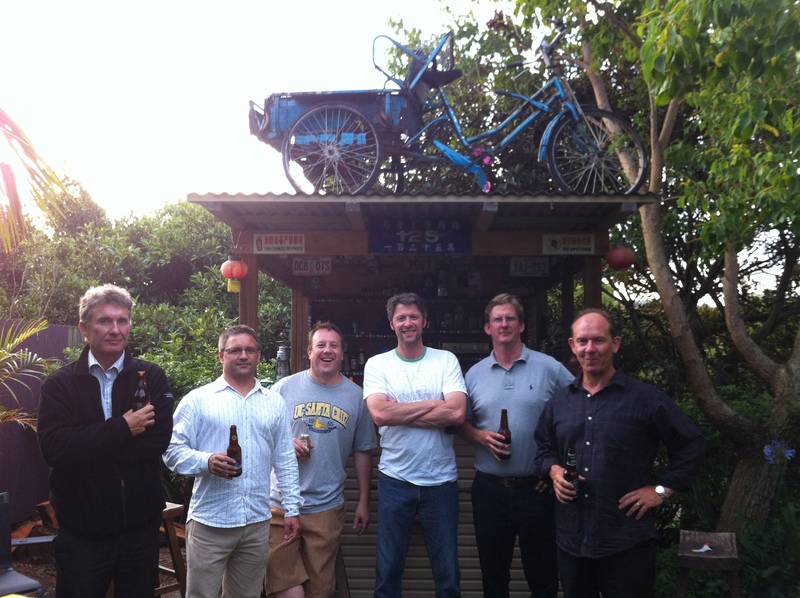 Thanks for the hand in getting the bike onto the roof of the Cantina, fellas. On this BotF Kris Bringle voyage, we inducted Phil and he told us about a Back of the Ferry tradition that would be coming to an end after 30 years. 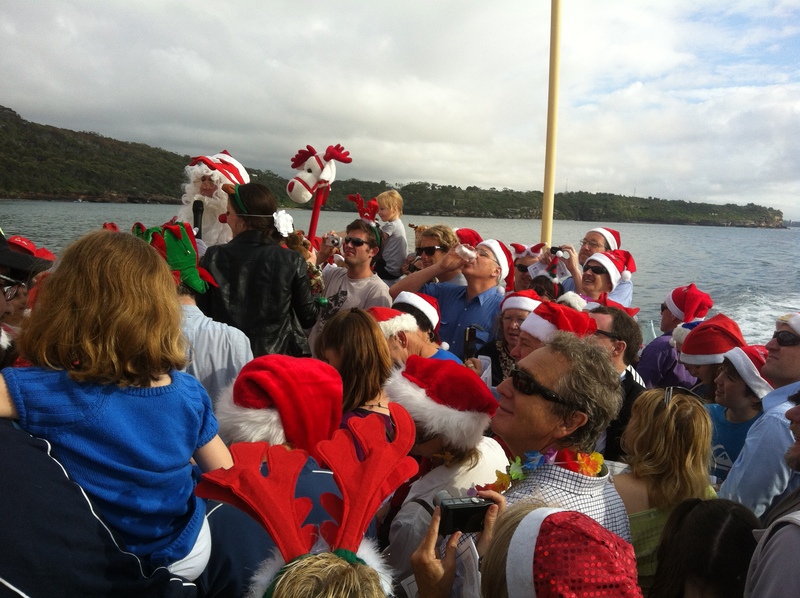 A Northern Beaches business (name never revealed apparently) has done the last Friday before Christmas, dressed as Santa on the 8am Manly to CQ ferry. He roams the ferry singing songs and handing out gifts. Phil was our man on the spot and captured the last voyage and in particular his stop on the back (which is actually the front on the way to CQ). The Manly Daily tells the story here. That’s a long gig and a mighty fine tradition. If BotF Kris Kringle lasts 2 years – I’ll be happy. Another aspect of the BotF Kris Kringle tradition will be the pre-voyage visit to Hart’s Pub for a warm up. Hart’s Pub has had a great year and they never fail to have a unique on tap. For our last visit for 2011, they again delivered and we got to shake hands with Scott Morgan, the head brewer at the Rock’s Brewing Co whose beers feature prominently on the Hart’s tap list. 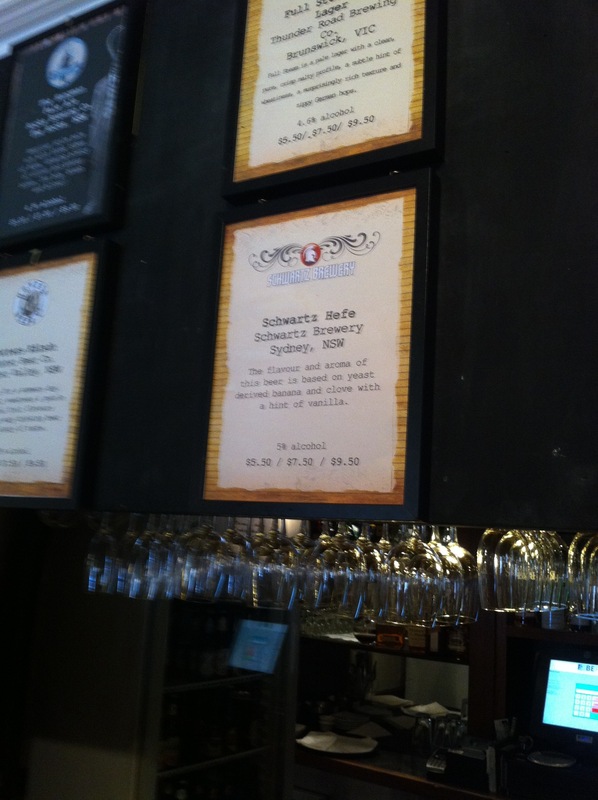 Today’s offering was Schwarz Hefe – a very fruity concoction. The aromas craft brewers are creating are simply mind-blowing – a full-frontal nasal assault. Tastes pretty good too – very repeatable. So that’s it from BotF before Christmas. Enjoy the big day – and may the presents be plenty and in liquid form. Great post mate wish I could have been there for the Kriskringle. Fantastic that you got the bike on the Cantina. Looking forward to seeing you and the crew at Rainbow!